Given how high-tech spacecraft tend to be, I was surprised to learn that existing space vehicles tend to use good old-fashioned glass (albeit a rather expensive kind). 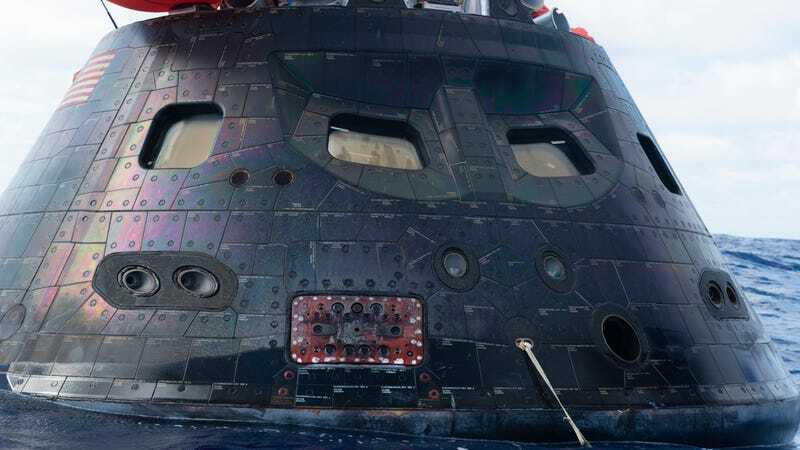 But for the next-gen Orion spacecraft, NASA has been working overtime to find something stronger, lighter, and just a little less fragile. The historical preference for glass is down to its optical properties, which allow for all the kinds of high-res photographs of space that we know and love. But according to NASA, glass weakens under sustained pressure — not ideal on a years-long expedition to Mars (or anywhere else for that matter). So for the Orion spacecraft, NASA is trialling acrylic materials — ironically, the same thing used in aquariums across the country. It retains glass’s high-quality optical properties, whilst dramatically decreasing the weight and thickness. The first Orion test mission flew with some acrylic panes, and as you can see from the awesome photo of a very damp re-entry vehicle above, they all survived the flight intact.